I move over to the curb as my friend and an enraged taxi driver continue their dialogue in the middle of the street. Cars on either side are incessantly using their car horns to signal their frustration with the gridlock. Some try to slowly squeeze past in the small gap that is not taken up by the taxis. Meanwhile the line of cars is rapidly growing in length. “Forget it. You’re the one who overtook us! As my friend had exited our taxi, another taxi had overtaken us, resulting in a small collision. While our taxi was scratch free (well, no additional scratches from the collision), the side mirror assembly of the other car was now in pieces on the ground. This move was a mistake. By engaging in the conversation about cost, my friend could be perceived as accepting responsibility for the accident and now the question is reduced to “how much will he pay”. The taxi driver quickly picked up on this. How are they negotiating now? Yes, old-style bargaining over money. This battle of attrition continued for about 10 minutes. So please picture 10 minutes of standing in the middle of the road, emotions running high, and with cars passing within centimetres, in the dusty, hot and humid air of South East Asia. And then we all hear a *CLICK*. Was that… Could it be… Yes, as I look over I see that my friend have successfully put the side-mirror back together. The taxi driver reluctantly tries the electric mirror control. And voila, it’s all working and no visible scratches! 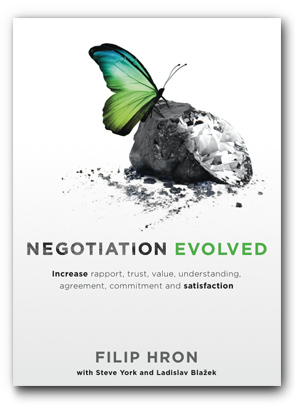 What begun as a clumsy bargaining process was resolved using masterful negotiation. My friend had snapped out of the traditional “I’m right and you’re wrong” or “I want XYZ from you” mentality, and instead removed the need to have a negotiation altogether. In our book we named this technique preventative options – options (or solutions) that allow us to prevent the need to have particularly difficult negotiations. While our example here was quite trivial, this technique becomes a very powerful option for values-based negotiations where parties will never change their mind or accept being “wrong” (e.g. on abortion, religion, global warming, gun control, etc).